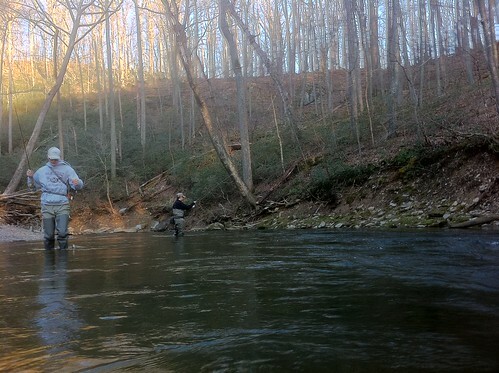 The Gunpowder river is flowing at 266 CFs and is 56 F. Try Falls Rd through Bunkerhill this weekend as the water drops. Until then, don’t feel compelled to wade deeper than shin or knee deep and consider bringing along a wading staff. Josh just called in from Falls Rd this morning to report Hendricksons on the water and in the air. My guess is that if he was not going to prom this evening he would probably still be fly fishing the Gunpowder! With the water up, try Mike’s Unusuals and Phunny Emergers sized #14. Light bright Zonkers in olive and black will also do the trick especially around undercuts and woody debris. Stop in for a 5ft or 10 ft sinking leaders to fish the streamers effectively. These leaders will also be perfect additions to your kit for the Shad run. The Dogwoods are blooming! It will take a few days for Deer Creek to settle down but don’t miss fly fishing for Shad this Spring as water temps are on the move up. The Susquehanna flats have been slow this week with water temperatures just approaching 60 degrees F. Eric Snyder just dropped off some chartreuse and white, pink and white and red and yellow shad flies with coneheads that are sure to produce. Please note: Little Falls and the Gunpowder River downstream of the gas line including Upper and Lower Glencoe, Sparks Rd through Phoenix Rd will be receiving another stocking of rainbows next week and will be closed to fishing till April 27. This entry was posted in fishing report on April 20, 2013 by Theaux Le Gardeur. The Gunpowder River is flowing at 92 CFs, is clear and 46 degrees F. The last of the stoneflies are fading. Hendricksons have been on the move since last Saturday. Cooler, not colder nights have kept me from kicking the water trough first thing in the morning to break up the last of the winter ice. Banks are still soft and quite a few are undercut so mind your step as you’re getting back to the river. Stop in and pick up some of Mike Bachkosky’s beautiful Catskill style Light Hendricksons in a #14-16 and purposefully built snowshoe rabbit emergers and unusuals. Blue Winged Olives are present in the upper river but small pheasant tails sized #16-18 and zebra midges in the #20 range are accounting for more fish than the dries. I was lucky enough to join Mike Colegrove and Josh Reider on the stream after work last weekend. Mike found a bright, stocked rainbow that had moved all the way up into the catch and release section and Josh tricked a small brown that gave his Abel reel a run for first prize in the beauty pageant. While I’m used to getting great feedback from customers about how well these guys handle duties at Backwater Angler, I was amazed at how equally skillful these guys are on the other side of the counter and look forward to fishing with them again soon. This entry was posted in fishing report on April 7, 2013 by Theaux Le Gardeur. Tune in to MPT April 2, at 8:00 PM to watch a 25 year anniversary special of Outdoors Maryland. 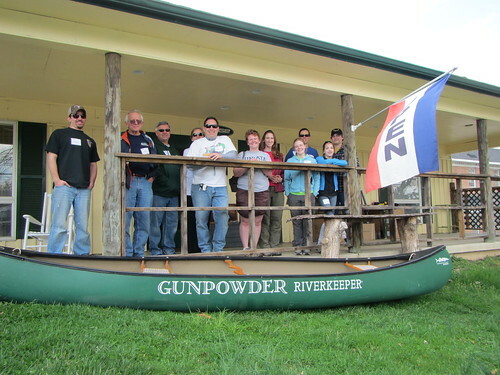 At 8:30 PM MPT is airing a segment shot in 2010 on the Blue ribbon fly fishing opportunities that await on the Gunpowder river. Enjoy! This entry was posted in news on April 2, 2013 by Theaux Le Gardeur. 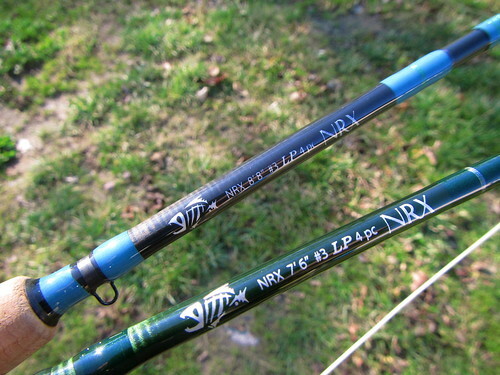 Thanks to Gary for the Fishing report and gear review! Well as you know it took me about 4 months to get over leaving my beautiful 3/4 wt Scott in the Masemore parking lot and I still miss it very much! So if anyone reading this found the rod…please deliver it the Backwater Shop. But….life goes on and the new Loomis NRX 883-4 3wt accompanied by the Bauer CFX1 reel you sold me this past weekend kept me in the river for nearly 5 hours!. What a beautiful looking and high performing set up! It shoots the line through effortlessly and with hardly a sound and is both powerful for long casts and subtle for fishing the nearby seams. 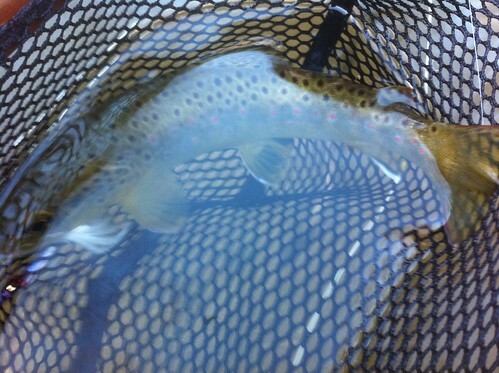 I was lucky enough to catch 7 nice browns all round the 8-9 inch range and lost as many. I suspect one was large as it stopped the emerger in mid swing and snapped my tippet below the knot to the leader. Fighting fish on the new rod was a treat and I am really glad I bought the appropriate reel because it created a perfectly balanced mechanism. It makes me want to start playing ‘hooky’ again. P.S. Sunday I took it outside and set it up just to look at it! 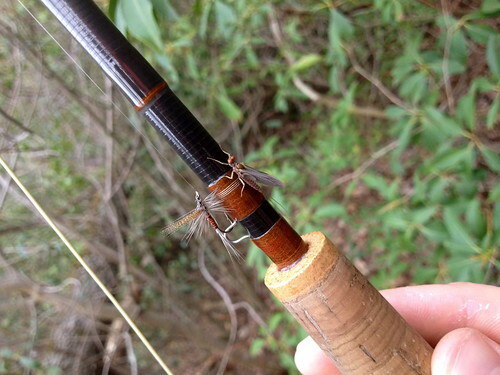 This entry was posted in fishing report, gear on April 1, 2013 by Theaux Le Gardeur.